In my Unlimite list of blog post ideas post, I mentioned that I had been lacking inspiration lately and that all I have on my mind is my health and mentioned that I would probably do a post about it..... so here I am, this is my little "Life update"
As much as I post online and do talk about personal things, I'm also very private. 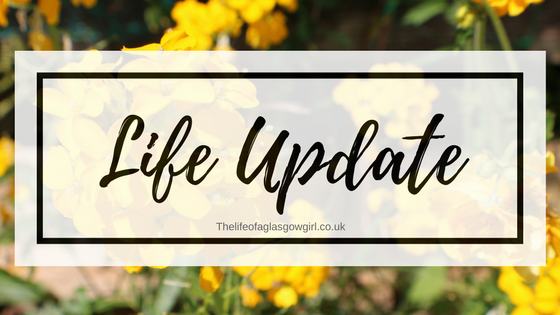 There is a lot that I don't and won't post about but today I'm going to open up a little, as much as I can anyway about things that have been going on lately that have caused me to get stuck in a bit of a blogging rut. So my health hasn't been great to say the least. I'm still getting tests etc... done to see what's going on with my womb. Although my periods have become more regular and aren't coming every other week now, I'm still suffering with unbelievable pain. I'm at a point now where I'm beyond fed up saying the same thing over and over to my Dr to be told "take this and see how it goes" I want, no, I NEED something done about it. My scan showed that my coil was no longer in place and I had an internal one done to make sure it's not went up the way, but it's not so that's a good sign! But they still can't determine why I'm getting pain. So that's been a big bother recently. My back pain also seems to have gotten worse and some days I can't even lift Leon because of how bad it is which really gets me down. I can't lift or play with my own child and it makes me feel like a failure to say the least. I've just been given more pills to take for it and being told that it's still chronic back pain which just gets me down. They don't know the cause, they can't do much more than they already are and I just can't deal. It's annoying. My mental health though is really getting better though, I'm glad about that because that's one thing on the never ending list that's actually improving. I don't talk about leons health and to be honest I don't want to start. But it's just annoying that I feel I'm fighting a loosing battle when it comes to it because I still have no real answers and not much further on with any of it. Now my gran has asked that I don't talk about her health and some things that are going on at the moment so obviously I'm going to respect that, but I do need a little vent so I'll try and do it as best I can without breaking her privacy. Last year she had a stroke and she luckily didn't suffer any paralysis from it which was a miracle in its own. But since then she's still been suffering major headaches and keeps being told she will see a neurologist but still we haven't had any word about it. I'm frustrated for her, we don't know anything and her headaches are now daily and getting worse. I'm worried, scared and more. She also has a few other things going on atm and it's scary, we don't have answers and words have been thrown around like it's no big deal which really irritates me. My grans scared and I don't blame her. She also has an operation coming up soon which isn't a major one thankfully but it's still worrying after being told all that can go wrong because of her age. She may or may not be in hospital for a few weeks recovering, they can't tell much in terms of healing time and they don't know what kind of scar will be left and I can tell it's bothering my gran as it will be very visible afterwards. I'm so worried about my grans health. I'm worried about her life expectancy, I'm worried that this may have been our last Christmas together and that she won't see the holiday. There's so much playing on my mind at the moment and it's driving me insane. I just feel like we take 1 step forward to take 3 steps back. My minds on overdrive, so much information swirling around it and I feel like it's never getting sorted. Everyday I'm thankful for everything we do have and the time we have. I'm thankful for so much but it is a daunting thought that it may not last. Hi Joradanne, health worries trump money worries, don't you think. I hope you get to the bottom of all of them. In a way it maybe a good thing if it turns out your dislodged coil is causing your problems as it could be easy to fix. U hop you get to the bottom of both your Grans and sons issues too. It took us seventeen years to get to the bottom of our son's health issues and it was no joke. Ohh lovely this is awful! I really hope they can help youu. Get to the bottom of what's going on, I'm sure this isn't helping with Leon's and your Gran's health! I really hope things get better for youu.